1. How long should my dog take METACAM? 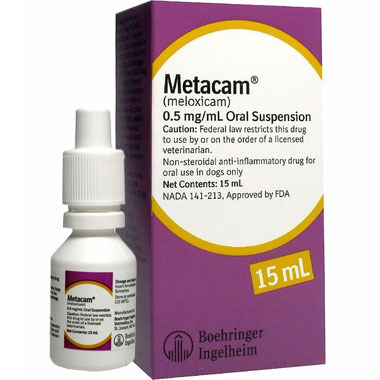 Your veterinarian will recommend a treatment plan and may suggest that your dog try METACAM for a specific period of time. Your veterinarian may ask you to report back or return with your dog for a follow-up evaluation to determine if treatment should continue. Just like people who have osteoarthritis, your dog will likely have to live with this condition for the rest of his life. You can feel comfortable giving METACAM knowing that it has been safely used to treat dogs with osteoarthritis around the world for over 20 years. 2. How does METACAM work? METACAM targets and relieves both the pain and inflammation caused by osteoarthritis. Relief from arthritis pain can help restore mobility, allowing your dog to return to many of the activities that you both previously enjoyed. Best of all, it can be given once daily, which provides a full 24 hours of relief. 3. Why can't I just give my dog aspirin? Aspirin is a drug that is not approved for use in animals. Aspirin should not be given during METACAM therapy. 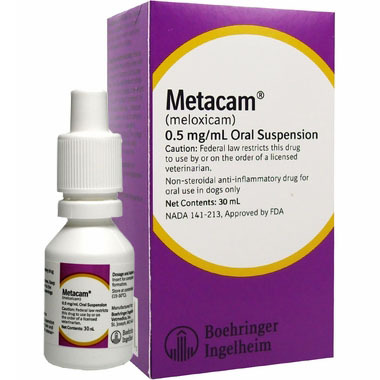 Also, METACAM should not be given with other anti-inflammatory drugs such as cortisone, Rimadyl® (carprofen), ibuprofen, Previcox® (firocoxib), or Deramaxx® (deracoxib). Be sure to tell your veterinarian about any other medications your dog is taking before beginning treatment with METACAM. 4. What more can I do to help manage my dog’s pain? METACAM therapy is one of a number of things that may help relieve your dog’s osteoarthritis pain. 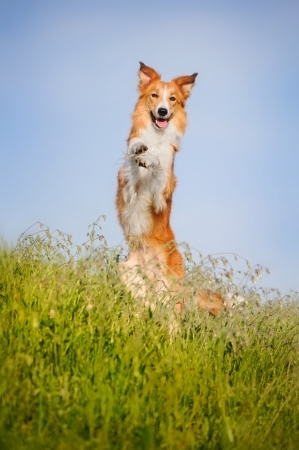 Your veterinarian may suggest a weight loss program or exercise regimen. Talk to your veterinarian before starting your dog on any weight loss or exercise plan. You can also help to make your dog as comfortable as possible by providing a soft place to sleep and keeping him or her warm. Performing massage and physical therapy on your dog as directed by your veterinarian can relieve joint stiffness and increase range of motion. In addition, raising food and water bowls to avoid neck strain, installing ramps to avoid your dog having to use stairs, putting non-skid runners on slippery surfaces, and other such supportive measures can help make daily activities less painful. 5. 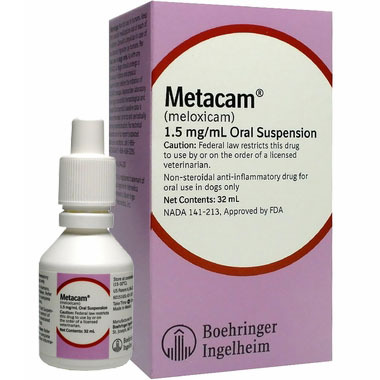 Why does METACAM come in an oral liquid form rather than a pill or tablet? Just as many children's medicines come in liquid rather than pill form, liquid METACAM is designed to make it easier to administer the right dose to dogs. 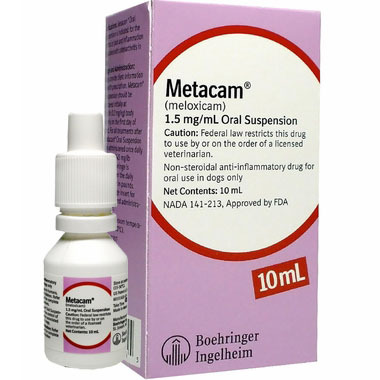 METACAM Oral Suspension is made in a smooth liquid form so that dog owners can dispense it easily from the syringe. Because it's liquid, it is easy to adjust the dose in small increments using the measuring syringe, with a precision unavailable from a rigid tablet. It is easily applied to the dog's food or given directly into the dog's mouth. Moreover, liquid METACAM is readily absorbed by dogs. And, dogs love the sweet honey-flavored taste. METACAM, the first NSAID available as an oral suspension, offers a highly convenient treatment option to dog owners and allows for accurate dosing for any size dog—something that chewable tablets cannot always achieve. 6. Can METACAM be used in very small dogs? Even small-breed dogs get osteoarthritis. That's why a special low-concentration METACAM Oral Suspension for small dogs was developed. 7. How do I administer Metacam? 8. What if I miss a dose? The effectiveness of meloxicam was demonstrated in two field studies involving a total of 277 dogs representing various breeds, between six months and sixteen years of age, all diagnosed with osteoarthritis. Both of the placebo-controlled, masked studies were conducted for 14 days. All dogs received 0.2 mg/kg meloxicam on day 1. All dogs were maintained on 0.1 mg/kg oral meloxicam from days 2 through 14 of both studies. Parameters evaluated by veterinarians included lameness, weight-bearing, pain on palpation, and overall improvement. Parameters assessed by owners included mobility, ability to rise, limping, and overall improvement. In the first field study (n=109), dogs showed clinical improvement with statistical significance after 14 days of meloxicam treatment for all parameters. In the second field study (n=48), dogs receiving meloxicam showed a clinical improvement after 14 days of therapy for all parameters; however, statistical significance was demonstrated only for the overall investigator evaluation on day 7, and for the owner evaluation on day 14. 10. Is it palatable? Will my dog eat it? 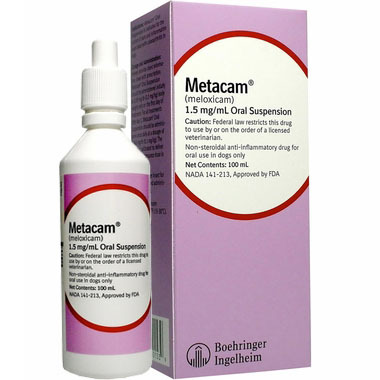 Metacam Oral Suspension was accepted by 100% of the dogs when veterinarians administered the initial dose into the mouth. 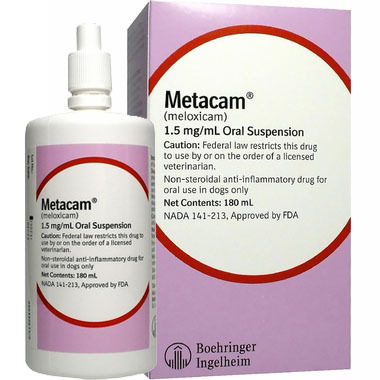 Metacam Oral Suspension was accepted by 90% of the dogs (123/136) when administered by owners. Problems associated with administration included refusal of food, resistance to swallowing and salivation. 11. What happens if I overdose the pet? Seek emergency veterinary medical treatment. Symptoms of Metacam overdose include nausea, vomiting, stomach pain, loss of consciousness, drowsiness, headache, cardiac arrest, stomach pain, seizures, little or no urine production, and slow breathing. 12. How do I store Metacam? Store at controlled room temperature, 68 - 77°F (20 - 25°C). Excursions permitted between 59°F and 86°F (15°C and 30°C). Brief exposure to temperature up to 104°F (40°C) may be tolerated provided the mean kinetic temperature does not exceed 77°F (25°C); however such exposure should be minimized.